At the center of Victory Square Gardens there is an obelisk crowned with the “She-Wolf” feeding Romulus and Remus. It is a bronze copy of the famous 5th century BC Roman “She-Wolf” and was donated by the city of Rome. 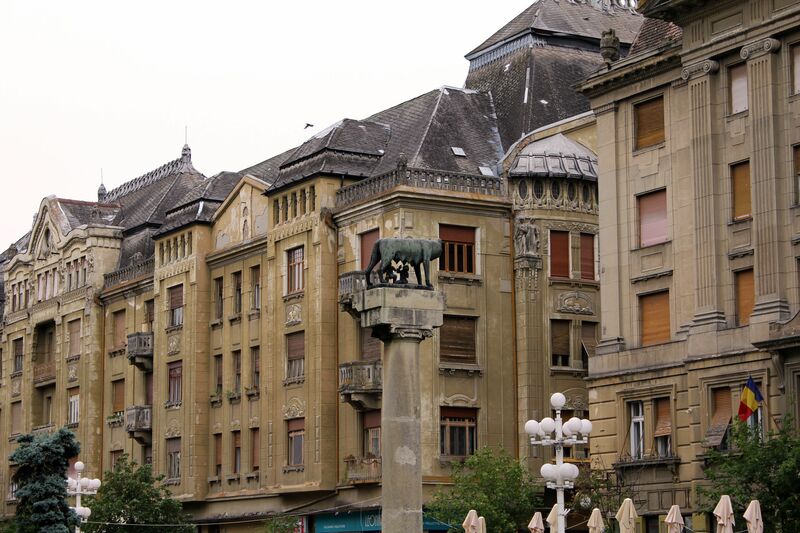 Symbolically, the statue represents the common Latin origins of Italians and Romanians. In fact, the territory of today’s Romania was an important part of the Roman Imperium known as the Province of Dacia. The early Roman presence left the traces till our days; as an example the modern-day Romanian language have some Dacian roots with a noticeable Latin influence and borrowings from Italian. 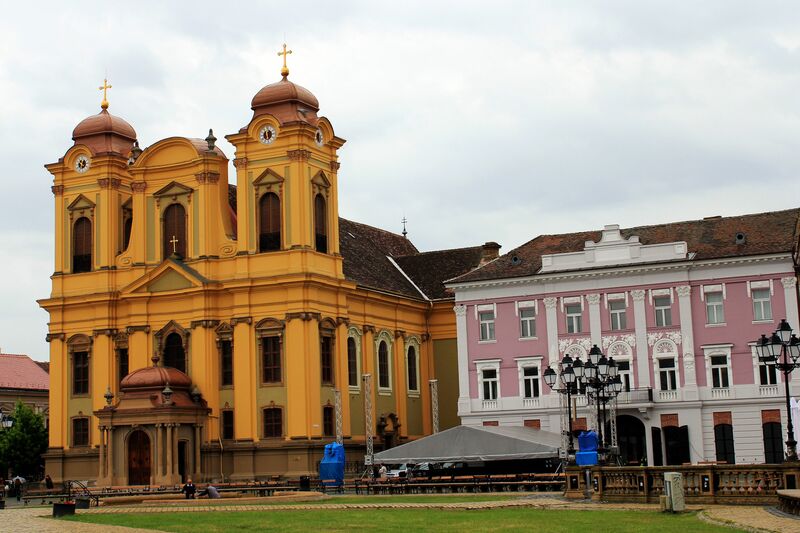 The Orthodox Metropolitan Cathedral is a relatively new “addition” to the city of Timisoara. The construction started in 1936; interrupted by WWII it was finished in 1946. 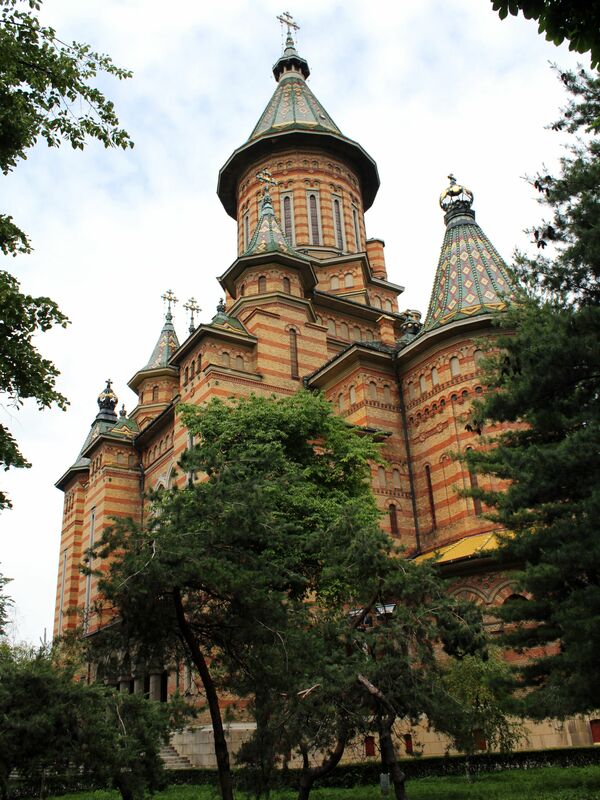 Architecturally, the cathedral combines the Byzantine style with local elements from old Romanian-Moldavian styles. It is still one of the biggest churches in today’s Romania. Union Square is the oldest square in Timisoara, and its dominant architecture clearly differentiates from that of much younger Victory Square. It is flanked by imposing 18th and 19th Centuries buildings of St. George Roman-Catholic Cathedral and Serbian Orthodox Cathedral with Bishop Residence. It seems that these two “not-so-in-union” Christian churches (here facing each-other in peace) gave the symbolic name to the square - Union. Till 1919 the square was known as “Lasonczy Market”, honoring the 16th century commandant Stefan (Istvan) Lasonchy bravely defending the city from the Turks. 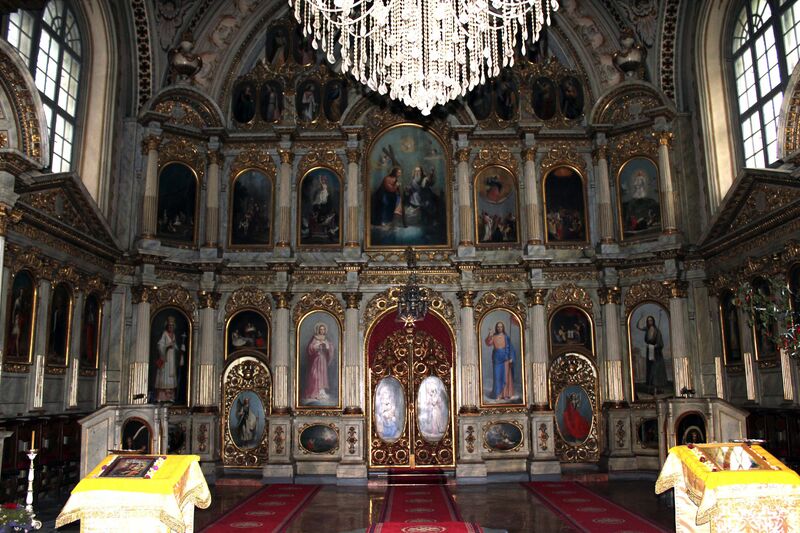 The Serbian Orthodox Cathedral (built between 1745 and 1748) represents the baroque style. The structure of the church beautifully contrasts with the façade of standing next to it Bishop’s Residence (Vicariate). 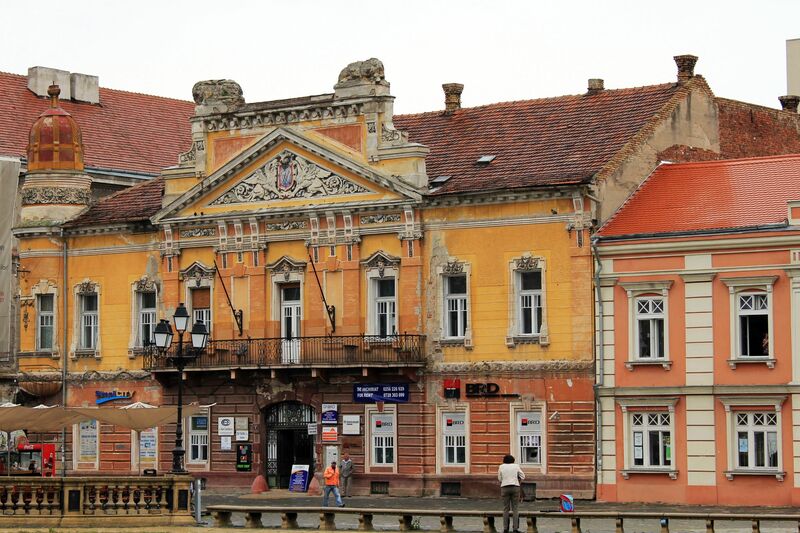 Both structures give testimony to strong Serbian presence in Banat (indeed, in the past Timisoara was shortly under the control of the Serbian Kingdom, but even today, it is still located very close to the Serbian border). The imposing Roman Catholic Cathedral was designed by Viennese architect Emanuel Fisher von Erlach in similarly – it represents the baroque style. The construction works started in 1736 and lasted for 18 years. After the death of Fisher von Erlach in 1742, local architects from Timisoara - Theodor Kostka and Alexander Steinlein took the leading role in the project. The painting of St. George in the main altar is a work of Michelangelo Unterberger, while organ was made by Austrian master - Carl Leopold Wegenstein. Other interesting buildings facing the square are: equally beautiful Baroque Palace, Brück House and Nikolaus Lenau Building. The 18th century Baroque Palace for long served the city as a prestigious municipal building (Governor’s residence, County House, Prefecture…). Its large reception hall hosted visits of emperors and kings as well as prominent men of art (Franz Liszt, Johannes Brahms….). Since 1984 it houses the Museum of Fine Arts including works of 15th through 17th century Italian, German and Flemish masters. Due to its unusual design Brück House is one of the local tourists’ attractions. Although most of the building is located along the Mercy Street, its main frontal façade is facing the Union Square. 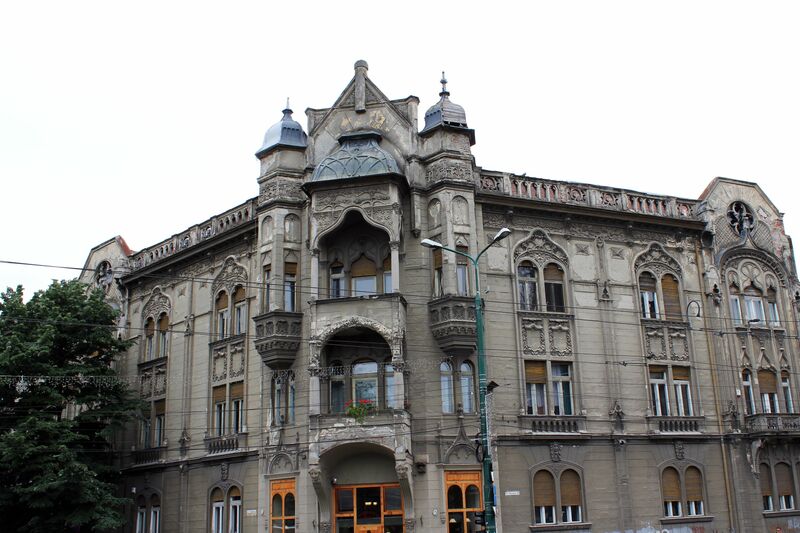 The building was designed by Laszlo Szekely and built in 1910 for Salamon Brück. 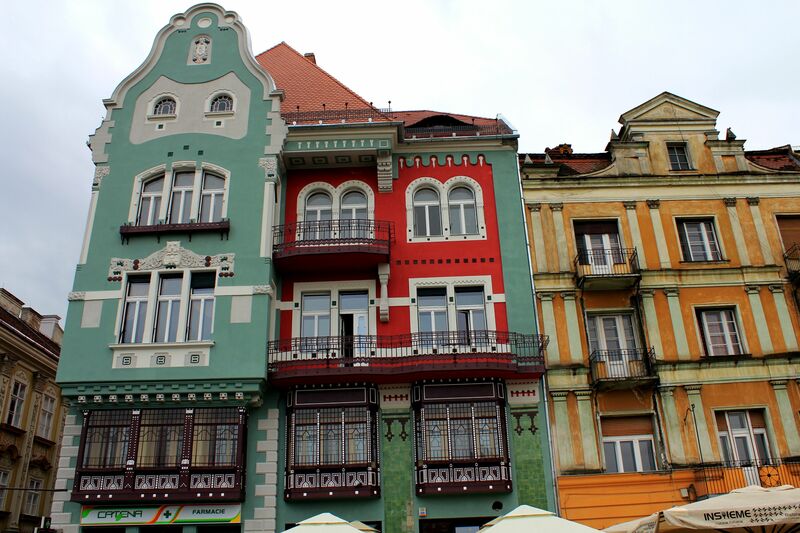 It represents the colorful mixture of Art-Nouveau and Secession-styles contrasting with predominantly baroque architecture facing the square. It is worth to note that inside, an original elevator dating from 1911 is still in operation! The Bruck House was raised on the place of an old pharmacy “Crucea de Aur”. Interestingly, Salomon Bruck continued this old tradition, for years operating the pharmacy on the ground floor. The Nikolaus Lenau Palace was built in 1761. In its early years it was home to the first municipal theatre; today it houses the High School. Scont Bank is another magnificent building facing the Union Square. Like few other structures it is an architectural “newcomer” (junior) among the buildings surrounding the square. Designed by architects Marcel Komor and Dezso Jakab it was built at the beginning of the 20th century. 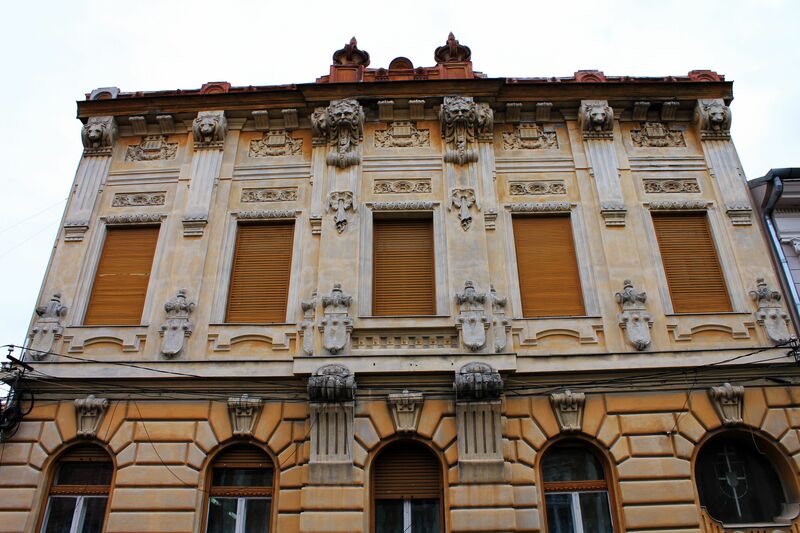 It represents Hungarian art-nouveau with distinctive curved walls and lines of decorative turquoise tiles. For many observers, the sophistication of curved shapes and façade’s asymmetry points to the influence of Gaudi. In the middle of the square stands the statue of Holy Trinity. The base of the monument includes allegoric reliefs representing human misery inflicted by plague, famine and war. 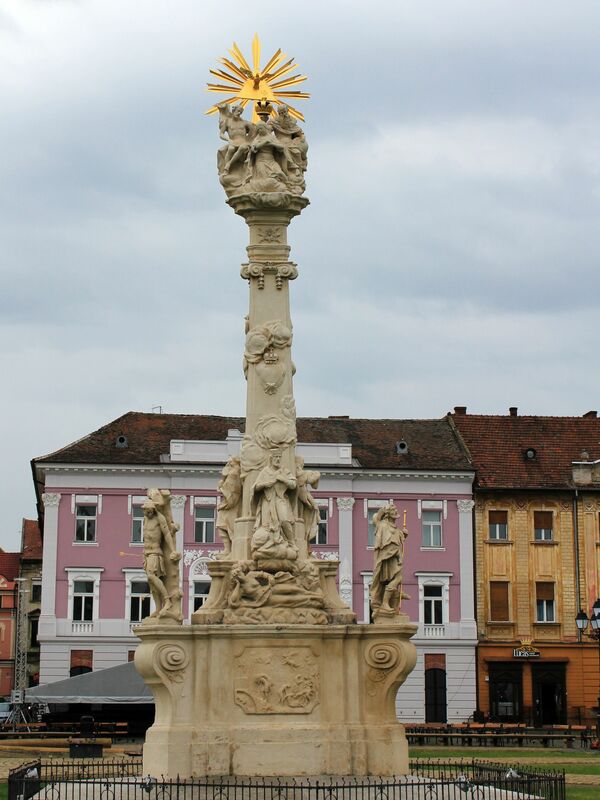 On the top of the pedestal are statues of saints and the column crowned with the statue representing Holy Trinity. The monument was commissioned by Timisoara’s counselor Anton Deschan von Hansen and installed in 1740 in front of his house. The statue reflects his personal grief due to the loss of wife to the plague that stroke Timisoara few years earlier and suffering of his compatriots during the wars with Turks. In 1752, the monument was moved to the Union Square. Not far from the monument there is an artesian fountain bursting with water from an aquifer hidden some 400 meters below the square. Originally this deep well reaching more than 400 meters below the surface was dug-out to provide the city with drinking water during frequent sieges. Unfortunately the aquifer water turned out to be highly contaminated with minerals and methane and so not very useful for drinking. While these days the still existing fountain offers pleasure in hot sunny days, it also gives an evidence of so technically challenging engineering achievement as for 19th century. 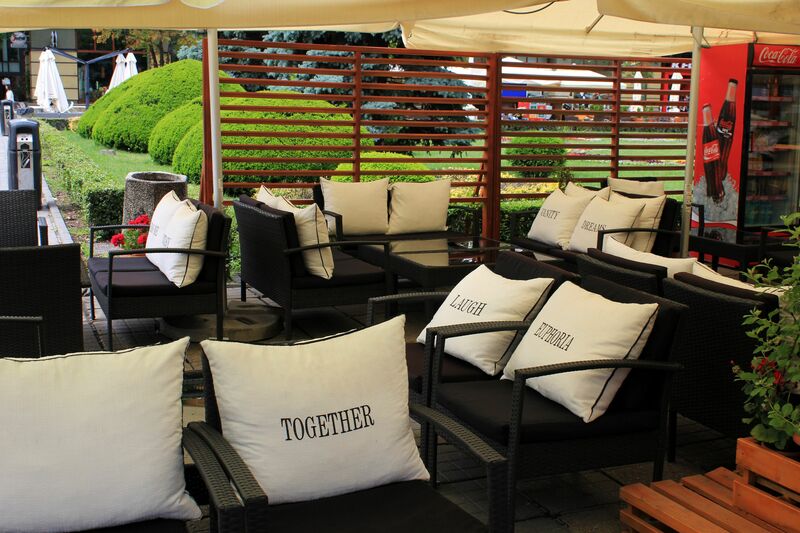 It’s one more prove that Timisoara was (and still is) a special place. And more “uniqueness” – the major part of the Union Square is covered by grass. 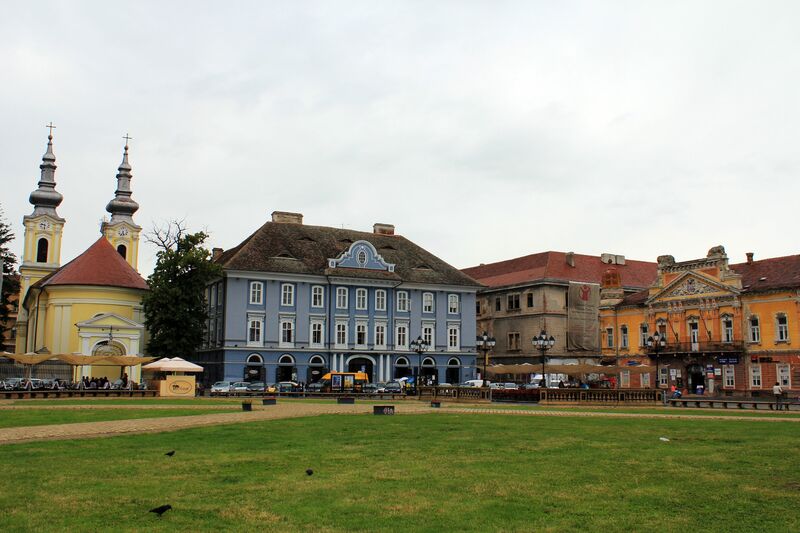 At the first glance it is so unusual to see such landscape in the heart of the old city, but hey, do not forget - Timisoara is called the City of Parks and Gardens and there is the reason for that! This is the oldest square in Timisoara and the center from where the city started to spread at the beginning of the 18th century. The square is flanked by some oldest municipal buildings like Old Town-hall, Garrison, Council of War, Military Casino and St. Mary and St. Nepomuk’s Monument. The latter was built in 1756 by Viennese sculptors Blim and Wasserburger. The monument was made in richly ornamented Rococo style. The main statue represents St. Nepomuk – the spiritual patron of Catholics from the region of Banat. The statue of St. Mary with a flower of lily in one hand symbolizes the purity. Since long, the Balkan Peninsula was home to Sephardic Jews and Timisoara was not an exception. At the peak, the Jewish population of Timisoara reached almost seven thousand souls. Out of several synagogues only three survived numerous wars and effect of time. The most beautiful one – Fabric Synagogue was designed in Moorish style by the Hungarian architect Lipot Baumhorn (He was a real champion in this field designing some 20 synagogues on the territory of former Austro-Hungarian Empire). The Great Synagogue, built in 1865 in an Oriental style almost 150 years later is still one of the largest synagogues in Europe. Both are currently closed waiting for structural repairs to make them safe. The last one – Orthodox Synagogue is the only one opened for religious services and visitors. If you want to learn short history of the Timisoara and then start the walking tour at the Square Victoria, go to" Timisoara Walking Tour"